"The moon shines bright, as I rove at night..."
When I thought about this topic, I found myself musing on the songs and poetry of great Scottish nationalist, Robert Burns. The picture is just a plain pencil sketch on cartridge paper with no computer cleaning up whatsoever, just a slight colour tweak to add the blue tint. 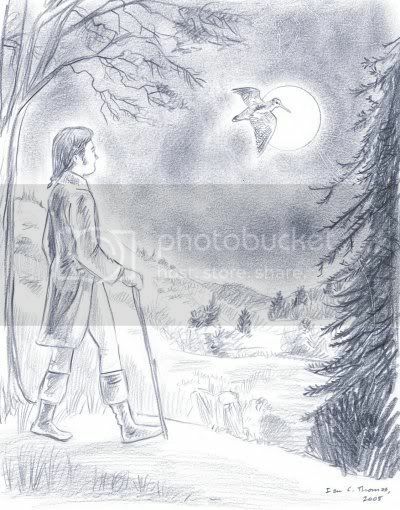 Here's my vision of Burns wandering the Highlands, off to meet his girlfriend, inspired by a couple of lines from Westlin' Winds (or Song Composed in August), which mostly describes the stirring of all the Scottish birdlife in search of mates, and his disapproval of the "slaught'ring guns" of "tyrranic man." The woodcock shown here is an odd nocturnal snipe-like bird that can see backwards better than forwards. Partly, Burns was in my thoughts with regard to our new sedition laws here in Australia: as writer David Marr recently pointed out, Burns wrote his political verse under a pseudonym, fearing imprisonment for sedition (as happened to other writers such as Daniel Defoe and Ben Jonson, not to mention Mahatma Gandhi, Christ, Nelson Mandela and locally, Eureka Stockade leader, Peter Lalor). There are many collections of Burns' poems set to music, but my all-time favourites are the very fine electric folk CD by Davie Paton, Passions Cry (re-recorded and reissued in a slightly different form as Fragments), and the gentler, but also very enjoyable Eddi Reader Sings the Songs of Robert Burns. Yep, that's the same David Paton from '70s band Pilot and Eddi Reader who fronted Fairground Attraction! Wow, just had a history lesson and a wake up (speakers were turned at full volume by gremlins) :) I like your pencil sketch with cartridge paper soft rubbings for the night sky! Very nicely drawn and Burns looks like he is drawn with sentiment. Thanks for the comment. appreciate it! btw, will you link me? I can imagine it hanging on my wall. You have captured your vision of the night, and what was being told in the song effectively with only the blue tint color. I like the lyrics of the song which exactly displays that he is first of all a poet. There were no repetitions of sentences whatsoever. I like the last sentence in the song. The illustrations cover of the CD’s are also very interesting. I love the mood you created with your very fine rendering - seems a fitting tribute (and a visual treat for us as well). Lovely! And I appreciate your perspective and musings on a poet I know little about - your thoughtful commentary makes me want to know more. Thanks Ian. Something so wonderful and textural about a pencil sketch, this one has a very calm gentle feel. And I didn't know all of the info about Robbie Burns, thanks for all the information I will have to look for the CD's at my library. Thanks again Ian for teaching me. And now onto the real purpose of my visit...this drawing is so lovely and evocative. I like the composition that places him within the natural setting, very fitting for the words he writes and the kind of man he was. Your pencil is very soft and gentle, creating a similar mood in the viewer. I love the idea that he's off to see his lady...so romantic! I also really like Robert Burns because he conveys a kinship with nature and animals. I would read "To a Mouse" to my students when I used to teach Steinbecks' Of Mice and Men in hope that they would actually understand the full meaning of the allusion in the title. Alas...I think they were too busy trying not laugh at their silly teacher trying to read a poem with a Scottish accent! Awesome drawing of Burns- but where is Mr. Smithers? Coffee81, I'd like to create a list of links to Illustration Fridayers in particular, as I sometimes have trouble locating my favourites, or I might add them to my Blog links - I haven't quite decided yet... a project for another day at this stage though. Isay, thanks! As you said, the wonderful thing about drawing on paper without much modification is that it's possible to hang the original on the wall - there's something about that tangibility which is still a bonus, I think. Tony, maybe Smithers is home ghost-writing more poems :). On sedition: I don't regard the legal silencing of parts of the population as an advance for democracy, but it's a predictable symptom when any government has too much power. This was beautifully done Ian, and I love the idea behind it! My name is Vadim Krakovsky. Browsing web I’ve found your touching Robert Burns picture. I am Burns poetry lover as you. I was inspired to write music to Burns poems. One of them is “Rigs o’barley”. It is not arrangement of traditional melody, but completely new composition. I am not-performing artist, just music composer, and recorded my song with team of Scottish folk musicians. I’d like more public exposure for the song and plan to place it on YouTube. I’d like this song was accompanied by video film based on picture you will make. So, it should be creative, touching, maybe humorous illustration of the story. It takes about 4 min 17 sec. I believe it would be good exposure for both of us, especially in the context of Robert Burns 250th anniversary in 2009. Vadim, I like your song very much - I'll write to you directly.